Spectacular Ocean Views | Ferry tickets inc. 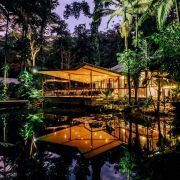 The rainforest is the ideal place to reconnect with nature, turn your phone and email off and simply enjoy lifes pleasures of what this natural playground has to offer. Whether its fun and adventure or relaxation and rejuvenation, you can engage and immerse yourself in nature whatever way you please. 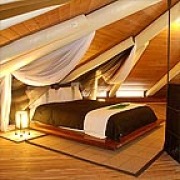 Accommodation ranges from just the basics to all out luxury. Suitable for singles, couples, families, romantics, explorers and naturalists, the rainforest has a theraputic appeal and one that will leave you feeling refreshed and revitalised at the end of your stay. The Daintree National Park comprises of two sections — Mossman Gorge and Cape Tribulation which are located 1.5hrs to 2hrs north of Cairns. The Mossman Gorge section stretches towards the Daintree Village and is one of the most beautiful and accessible tourist sites in the Port Douglas region. Home to the Eastern Kuku Yalanji Aboriginal people, the gorge itself remains in pristine condition with crystal-clear waters that cascade over granite boulders, dense rainforest canopy and more than 100 species of trees, shrubs and vines. 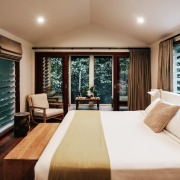 Silky Oaks Lodge is located downstream from Mossman Gorge, and is a stunning property nestled within beautiful natural surrounds. This boutique hotel lodge and Healing Waters Spa features luxury cabins designed to maximise privacy and comfort, and is the ultimate place for couples to unwind in peace and luxury. 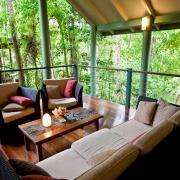 Daintree Eco Lodge & Spa is another boutique rainforest hideaway featuring 15 tranquil cabins. 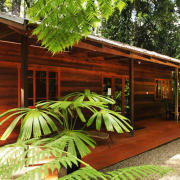 The lodge is located near the banks of the Daintree River, just a 5 minute drive from the Daintree Village. Cultural activities are popular here with Indigenous Guided Rainforest Walks on the property, and Aboriginal art workshops. 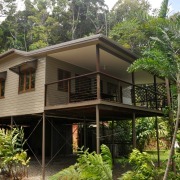 Red Mill House is also located in the Daintree Village area, and is a very popular option with birdwatchers and those interested in nature and wildlife. The owners are birdwatchers themselves and have extensive knowledge of local and regional birds and birding locations. An excellent reference library, binoculars for loan, plus local maps and up-to-date sightings help guests to make the most of their time in the Daintree area. The Cape Tribulation section of the Daintree National Park begins immediately across the Daintree River, and stretches in a narrow, intermittent strip for 80kms to the Bloomfield River. This is a magnifient part of the world. The area is vast and spead out so a hire car is a must to really explore the diversity of this region. With crystal-clear rainforest streams, rugged beaches, rainforest walks, and breathtaking lookouts there is plenty to discover. 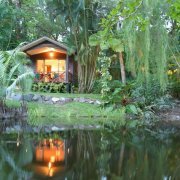 Life is pretty simple in the rainforest, you will find a range of accommodation from your basic budget cabins and safari tents to boutique retreats and private holiday homes. 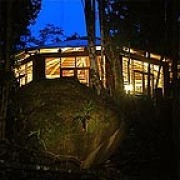 It's all about nature and rainforest living. 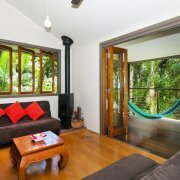 Wait-a-While in the Daintree is a stunning timber pole house offering private and secluded rainforest accommodation for up to 9 guests, perfect for large families or groups of friends. This pole house is one of the largest single dwellings ever constructed in the Daintree Rainforest, and only 600m from Cow Bay Beach. 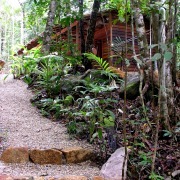 Cockatoo Hill Retreat is a very special private boutique resort situated on a secluded rainforest ridge and featuring just 4 cabins handcrafted from local timber. Elegant and romantic these cabins make for the perfect couples getaway. For those on a budget who don't mind roughing it up then Crocodylus Village offers simple safari tents with basic amenities for a wilderness type of stay. Kids will love Crocodylus, apart from the games area there is also a self guided rainforest walk where you can go on an adventure and perhaps spot a Cassowary. Malanda, Millaa Millaa, Tarzali and the Crater Lakes National Park are all areas where you will find beautiful sections of rainforest. The Malanda Falls Conservation Park is one of the best places to spot local wildlife such as the Lumholtz Tree Kangaroo, and Green Ringtail Possums. The picturesque Malanda Falls is regarded by many as the start to the waterfalls circuit. The township of Millaa Millaa just nearby attracts many visitors to the spectacular Millaa Millaa Falls, and the Mamu Rainforest Canopy Walkway is the place to see sweeping views of pristine rainforest-clad landscape from the observation tower and elevated walkways. The World Heritage listed crater lakes - Barrine and Eacham are just over an hour's drive up the Gillies Range from Cairns. Both lakes have clear blue waters that are surrounded by upland tropical rainforest. Lake Barrine features a walking track, giant bull kauri pine trees, privately-owned teahouse and boat cruises that make it a popular stop for visitors. Lake Eacham is a favourite for locals and visitors with swimming, birdwatching, picnic areas and shady walking tracks just some of the activities available. 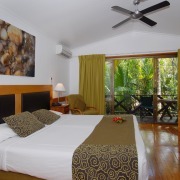 There is some rainforest accommodation situated around the Lake Eacham area. Cute cabins make for a gorgeous stay especially during the winter months when you can warm up beside a wood burning fireplace. Our favourites include Rose Gums Wilderness Retreat featuring 9 handcrafted pole and timber treehouses that are fully self contained; and Crater Lakes Cottages that comprise of just 4 luxury cottages all individually themed to make your stay a memorable one.